In an exclusive on-camera interview, developer Charles Florio said his company’s information was “stolen” and improperly used for construction of a would-be beer business tied to the mayor and his family. Florio said his company JCM Investors had nothing to do with the construction of the would-be beer store project at East 15th Street in Paterson. But Florio said permits were obtained and many subcontractors were apparently hired under the guise that his construction company, Prime Time, was general contractor for the site. Some permits show that Florio’s other company, JCM Investors, as owner of the property. Torres pleaded not guilty to charges of theft, misconduct, tampering with public records and other offenses before a judge in New Jersey. “They basically stole my identity. They used it to pull permits. We had absolutely nothing to do with the job itself,” Florio said. Florio said he has since reported his concerns to the New Jersey State Attorney General. Mayor Jose “Joey” Torres and three department of public works supervisors were arrested in March in an alleged overtime billing scheme associated with the project. Investigators said the mayor ordered ciy workers to do construction at the private site but records showed taxpayers were billed for the work. 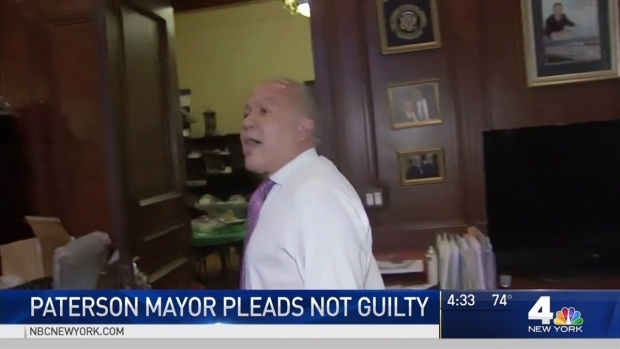 The mayor and the workers have pleaded not guilty. Torres' lawyer, John Azzarello, said in a call Monday evening that "the mayor denies he took any information from Charles Florio." "The mayor himself never directed anyone to pay cash," Azzarello said in the call. "Anyone who suggests otherwise is flat out wrong." Prosecutors offered a plea deal that could convince Mayor Joey Torres' co-defendants to testify against him. Brian Thompson reports. The developer also said he was pressed by city officials in December 2014 to pay tens of thousands in questionable fees in cash or else he could not obtain permits to rent out his developments. “When a buildings department tells me I have to bring close to $50,000 in cash, I see a problem,” Florio said. Florio said he made city officials give him receipts marked “CS” for cash so “… there would be no discrepancy later on.” Florio later sued the city over the matter and reached a settlement. Two city officials acknowledged cash was delivered by Florio. But the officials said the money did make it into city accounts. Under an open records request, the city sent the News 4 I-Team copies of calculator ribbon showing the amounts reported by Florio. The city could not provide an itemized accounting of the cash deposits. Deposit slips that included the money Florio delivered were also not provided by Paterson officials. 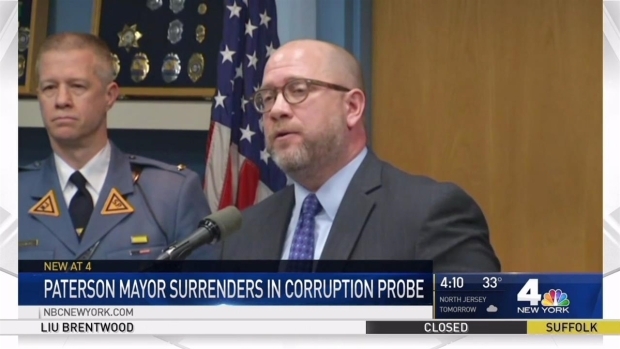 Paterson Mayor Joey Torres surrendered to authorities Monday to face charges in connection with a state corruption investigation. Jonathan Dienst Reports. “That money went into somebody’s pocket is my feeling,” Florio said. A spokesman for the state attorney general Christopher Porrino declined to comment. The FBI has its own ongoing investigation into alleged corruption at Paterson City Hall. Florio said after he was pressed to make cash payments, he hired a private investigator to follow Mayor Torres on and off for more than a year. It was that investigator who first filmed DPW workers doing construction at the would-be private beer store. “I felt there was some kind of corruption going on and I figured I should protect myself, my employees and my business. I did hire a private investigator,” Florio said. After being indicted in the alleged overtime billing scheme, Mayor Torres said he plans to stay in office while he fighting the corruption charges. A Paterson city worker turned himself in to police as NBC New York cameras were there to catch the moment. Brian Thompson reports.